Margaret has spent the past 45 years working with both horses and ponies in a variety of disciplines. Her students range from backyard horse owners and competitors to professional trainers and international competitors. A third generation horsewoman, Margaret grew up on her family’s ranch in Litchfield County, Connecticut. She began her career at age 4 and a half when her father purchased 9 untrained pony stallions for her and her brother to learn their skills on. The following year “The Broken Wheel Ranch” was established. Appearing in her first performance and giving her first lesson at age six, Margaret and her brother traveled the tri-state horse show and rodeo circuit trick riding, competing in both English and Western riding, and driving to promote the sale of ponies. 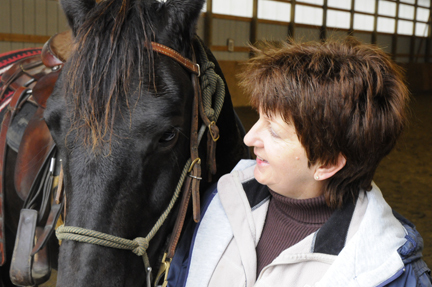 Margaret continued to train horses, but after a serious accident and sudden onset of deafness, she realized she wanted to find a better, safer way to work with horses. She met and worked with John Lyons, who, she says “taught me to teach.” She also met Ray Hunt, Buck Brannaman and Peter Campbell, all excellent horsemen. It was Ray Hunt, she says “who brought me the gift of going where I had to go to understand the horse.” Her work with those gentlemen had a profound effect on Margaret’s approach to training and teaching. Since Coaching Scott Monroe and his horse Shadow to two National Championships and three International selections for the US Equestrian Team, Margaret has devoted her time to establishing her indoor training facility at the Broken Wheel Ranch in Millerton, NY. A state of the art sound system and the opportunity for review of training sessions, workshops and private lessons through digital video recording make for a valuable and lasting contribution to your learning experience. 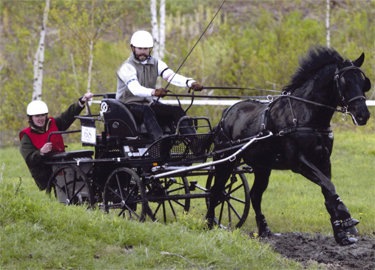 Margaret has the unique ability to recognize where owners and their horses become “stuck” and presents safe, sound, reasonable solutions that help owners move forward toward their goals. Her program is based on the actual facts about the horse, how to present yourself to the horse and how to work within the horse’s limited capacity of understanding. Whether you are a national champion, professional trainer, competitor, or backyard owner, we all want the same results: a safe, fun, enjoyable, successful experience with the horse. “The Better Deal” offers a proven program based on actual facts which gives you the opportunity to do just that.